This piece aims to provide the minimum necessary background to understand recent and forthcoming events in a rapidly changing situation in Yemen. 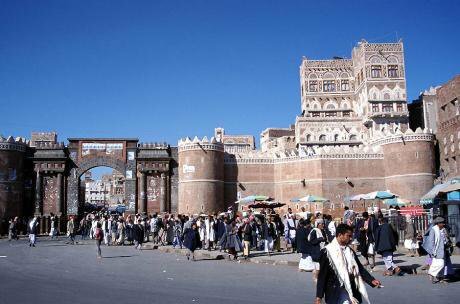 Bab_Al_Yemen. Wikicommons. Some rights reserved.The determination of the mass street demonstrations and occupations throughout the country in 2011 were insufficient to firmly exclude the former ruler from future involvement in Yemeni politics. Although Ali Abdullah Saleh was forced to abandon the presidency in November 2011 under pressure from the Gulf Cooperation Council (GCC) and the United Nations Security Council (UNSC), neither the GCC, the UNSC nor indeed the Yemeni people were able to force him out of the country. He remained in Yemen as a major force subverting the transitional process. His successor, former Vice President Abdu Rabbu Mansour Hadi, surprised many by not acting as a mere puppet to Saleh, but was unfortunately unable to manage the political transition towards a new Yemen. While most of the commitments included in the GCC agreement were formally implemented, in practice the transitional regime was unable to make the fundamental changes which were essential to bring about a ‘new’ Yemen and transfer power away from the previous elite groups. In addition to the points below, this was largely because the GCC/UNSC sponsored deal remained firmly within the confines of neoliberal policies and did not clearly and explicitly support a fundamental transformation and democratization of the country, which would challenge its existing elites. The Government of National Unity was formed as planned: with a majority of ministers from the main existing elite factions (Saleh’s GPC and the Islah party), who used their ministries as bases to increase their patronage and income while the ministers from minority parties, women, youth and civil society were unable to affect the situation. This government gained the reputation of being the most ineffective and corrupt in the country’s history. Islah’s influence kept it in power with the aged Prime Minister who was its man till mid-2014, when the party was seriously weakened in fighting with the Huthis. The National Dialogue Conference (NDC) was intended to bring together all Yemeni political forces, the traditional parties and personalities as well as the new ones emerging from the 2011 popular uprisings, including women, youth and civil society. Although delayed and the selection and representation mechanisms for its membership were somewhat debatable, this was an important political event where young people, women and civil society elements were able to express unorthodox views. Older influential ‘traditional’ leaders were compelled to engage with them as equals, something which some of them probably resented. The NDC produced over 1800 recommendations. Due to fundamental political disagreements, it was unable to agree solutions to the Southern question (discussed below) or decide the number of regions to be included in a federal state. Until recently, most people had never heard of them. The name of their movement is that of their leaders’ family. Originally set up in 1992 by Hussein al Huthi as the ‘Believing Youth’ social and Zaydi revivalist movement, it first operated in alliance with Saleh’s regime. However, Saleh encouraged the establishment of the rival Dar al Hadith Salafi centre in the heart of the Zaydi community. This led in 2004 to the first of a series of wars between the Saleh regime and the Huthi movement. Although Hussein al Huthi was killed in September 2004, the movement increased in strength despite worsening violent repression through 6 wars which killed thousands, displaced more, and destroyed the local economy and infrastructure. A ceasefire was agreed in 2010, and would probably not have held had the 2011 uprisings not taken place. Ideologically, the Huthis share the social characteristics of other fundamentalist groups, including claims to theological correctness, belief in unquestioning obedience to leaders and a retrograde attitude to women’s rights. Although a Shi’a group, Zaydi theological differences with Sunnis are few and the main distinguishing characteristic is their belief in the innate right of sada [ie descendants of the prophet] to rule. In 2011 the Huthis participated in the uprisings against the Saleh regime where, after March, they found themselves on the same side as some of their main enemies: Ali Mohsen al Ahmar (the main military leader fighting them during the wars) and the Islah Party, long-standing rivals in their home areas. Instability throughout the country gave them the opportunity of taking complete control of their home governorate of Sa’ada bordering Saudi Arabia by the end of 2011, and in the following years, of increasing parts of the neighbouring governorates of Hajja, Amran and Jawf. The NDC ended a year ago, on 25 January 2014, and the ‘implementation of the outcomes of the NDC’ has since then become a slogan used in all official policy statements, including those which completely contradict these outcomes. The year revealed the fundamental weaknesses of the GCC agreement through the slowing down of progress on reforms on the one hand and the worsening security situation on the other. The transition was due to end in February 2014 but extended without a new deadline, largely to allow the Constitutional Drafting Committee (CDC) to carry out its duties and the preparation of a referendum on the constitution and new elections. How did the Huthis rise from being a minority regional politico-military movement to taking complete control over the formal state in less than one year? Long suspected by most Yemenis, but ignored by the international community, and denied by both concerned parties, the alliance between the Huthis and Saleh has been the main factor behind their military success. The vast majority of the Huthis’ armed forces are military and security units loyal to Saleh who follow his orders. Moreover even senior Huthi leaders take orders from Saleh, as revealed by a recently leaked telephone conversation between Saleh and Abdul Wahed Abu Ras (Huthi representative at the NDC) where the former orders the latter to coordinate activities with Saleh loyalists, to ensure they control the country’s borders; they even discuss the appointment of the next Prime Minister: Abu Ras meekly acquiesces. Last week, it also emerged that the military refused to obey the Minister of Defence’s order to protect the Presidential Palace and other strategic locations in Sana’a: the only group who fought back were the President’s personal guard, suffering heavy casualties. Last September, people wondered how the Huthis managed to take control of the capital, Sana’a, without firing a shot; the answer is clearly that the army and security forces made no move to defend the legitimate regime of President Hadi. Many people are looking forward to the moment when the Huthis remember that Saleh insulted their leader. It was also thanks to Saleh’s military forces that the Huthis defeated the al Ahmars and the Islah party in Amran Governorate, where they burned down the houses of the leading shaykhs. In September, their other main enemy, General Ali Mohsen who had led Saleh’s forces against them in the wars escaped to Saudi Arabia, and the Huthis organized tours of his ‘house’ in Sana’a as well as ransacking those of the absent al Ahmars. Al Qaida. The list of Huthi enemies is increasing. They have alienated many segments of the population. Their tactic of blowing up the houses of anyone who disagrees with them in the areas they control, certainly silences opposition but also increases resentment. While they have taken control of many Zaydi areas in the country, in the Shafi’i areas the situation is very different and people are fighting back. This has little, if anything, to do with theological differences or a Sunni/Shi’a split, but is based on issues of social cohesion, including tribal allegiance, power, control and (the absence of) development and social security funding for an increasingly impoverished and suffering population. The other major strong fundamentalist armed group in Yemen, Al Qaida in the Arabian Peninsula (AQAP) is certainly using this situation to its advantage, promoting itself as the defender of Sunnis against takeover by Shi’a: for example, in al Bayda governorate, opposition to outsiders and other factors listed above have led local tribes to work alongside AQAP in opposition to the Huthis. The heavily populated governorates of Taizz and Ibb have few Huthis supporters and there are occasional battles between Huthis and others in these areas, and there is strong opposition to them. Further south, the Huthis have asserted their commitment to Yemeni Unity which means that the southern separatists have joined their opponents. While deeply divided with almost as many leaders as individual separatists, they are currently clearly unable to manage the former area of the People’s Democratic Republic of Yemen. One leader declared independence (22 January) of the two southern regions (under the proposed federation of 6 regions), thus opening the gates for Hadramaut in the east to separate from the rest of the former PDRY, something which most observers firmly believe they will do in the case of secession. While no less than 16 other separatist ‘organizations’ met to discuss the situation on January 23. At least until recently, they had considerable popular support from a wide range of Yemenis including all those who dislike the Islah Party, a majority of the population in the northern part of the country primarily populated by Zaydis, and among sada throughout the country. In addition, their populist positions such as opposition to the IMF-supported fuel price rises, claims to support law and order and opposition to corruption have increased the numbers of their supporters. And, of course, many Saleh supporters including military and security troops can be relied upon to participate in carefully staged supposedly ‘popular’ support demonstrations. The trigger for the events of the past week was, at long last, the presentation of the draft Constitution to the ‘Higher Authority for Monitoring the Implementation of NDC Outcomes’, after ten months of activity by the Constitutional Drafting Committee — much of it spent in luxury hotels in Abu Dhabi and elsewhere. While details of the proposed constitution are not analysed here, the Huthis’ main objection is the proposed federation of 6 regions. The original proposal excluded Hajja governorate with its outlet on the Red Sea from the region which covers most of the Huthi-controlled areas, though the Huthis have tried to control that area for a long time. Whether this was the actual only reason for their ‘slow’ coup may be revealed in coming decades. By January 22, they had full military control over Sana’a, including all its strategic institutions, something which they could have done months ago. They wanted to keep President Hadi as a puppet president, as they hoped he would be able to ensure acceptance of their coup by the international community, and hence a continuation of financial assistance. However Saudi Arabia, the main financier, has stopped payments for anything other than emergency humanitarian aid since the September take-over. The rest of the international community rejected this illegal takeover and aid, already far too limited, is drying up. Without an acceptable ‘front’, there was no hope of it being resumed. The Huthis overplayed their hand by kidnapping the Director of the President’s office, then imprisoning the President in his house and the Prime Minister in the Presidential Palace and trying to blackmail them into accepting Huthi nominees as Vice President, Deputy Ministers in most ministries and top officials in senior positions in security and other key institutions. At this point the President and Prime Minister had two options: resign or openly operate as Huthi puppets. They chose the first, and at the very least have retained self-respect and the respect of many Yemenis. Meanwhile, the majority of the population remain demoralised and impoverished, suffering from electricity cuts in the cities (most rural areas where 68% of the population still live don’t have electricity anyway) higher prices everywhere, massive unemployment, floods or drought in agriculture. Most people feel demobilized and are waiting to see what happens next, hoping it won’t be another bomb killing dozens of their youth. The economy is almost non-existent and the country’s groundwater is running out. A sad situation and a grim future. The ‘international community’ has not intervened effectively. Despite claiming to support Hadi, in the last 2 years, nothing meaningful was done to strengthen his position. Counter-terrorism took priority, drone strikes reduced Hadi’s limited support base and probably increased support for armed aggressive fundamentalists. In addition to developing an inclusive democracy, Hadi could have achieved strong and broad support throughout the country with massive development investment linked to effective humanitarian interventions. This would have enabled the millions of increasingly impoverished people to achieve something akin to a reasonable standard of living through agricultural development, other economic development (such as small and medium industries and services) in rural and urban areas, as well as improved social services and basic relevant infrastructure. Such a programme would have given hope to millions that a new Yemen is really possible, and would have persuaded many more to come out and demonstrate against the Huthis. It would have retained the energies of the thousands of youth activists from 2011, all hoping for a better life and participation in the country’s future. In recent days, increasingly serious demonstrations are taking place daily throughout the country opposing the Huthis, with many youth and women involved, something of a revival of the spirit of 2011; they are being repressed with beatings and shootings. As of 24 January, the Huthis are keeping the President and other senior leaders under house arrest. Formally, the successor to the President has to be the speaker of the Parliament, Yahia Ali al Ra’i, a firm Saleh loyalist who called for a meeting of Parliament for 25 January, a meeting which was then cancelled after southerners refused to attend; this meeting is necessary to accept or reject the President’s resignation. Negotiations are being held, presumably to persuade Hadi to withdraw his resignation. However keeping him incommunicado (his telecoms are monitored/controlled) is hardly likely to persuade him to withdraw it. Meanwhile, the alliance between Huthis and Saleh holds, but this is unlikely to last. Where the balance of power lies within this alliance will determine the future. On Monday 19 January, the only day when there was armed resistance to the coup.